If you’re like me, you love Savannah and are constantly looking for ways to escape there with your significant other. However, life tends to get in the way. Don’t let that stop you from visiting this active coastal town; it’s one of those Georgia vacations you MUST take on. Sure, there are tons of romantic and “grown up” things to do….but there are TONS of things to do in Savannah, Ga with kids, too!! Just a note…we did not visit Tybee Island this time, or take on the great number of eco-adventures. We hope to return early next year to explore that side of the area. Stay tuned! If you’re leaving Atlanta, expect about a 3 – 3.5 hr ride to Savannah, via Macon. I always like to remind people that the I-16 part of the trek is a little desolate, so don’t forget to fuel-up and snack-up before getting too far down that interstate. Ideally, you can leave bright and early in the morning…our first stop opens at 9am. HOWEVER, we didn’t get to go and it was all my mistake. We started our day on the trolley tour…and we were having so much fun that I decided to push the museum to ‘after lunch.’ Well, turns out they close at 2pm! Oh no! We will be making a day trip to Savannah shortly just to visit these museum, because I desperately want to go. In the mean time, learn from my mistake! Start your day at the kiddo museum. It opens at 9am, so you have cooler weather and plenty of time to explore. Also part of this family of museums is Pin Point Heritage Museum (highly recommended by a 365 Facebook fan,) Savannah History Museum (We ran into a friend in Savannah with young kids who had just returned from this museum. His 9yo was raving about it!) and Old Fort Jackson. After the museum, it’s time for lunch. I know you’ll want to stay as late as possible, but you can’t! Mrs. Wilkes isn’t open on the weekend (so you have to go NOW,) and they stop serving lunch at 2pm. Leave the museum between noon and 1pm, and head down for lunch. They offer old-school Southern style eats in a communal dining room for a flat fee (discount for kids.) Hours are 11am – 2pm, and you’ll need to prepare yourself for the line, but it will be worth it. Fun fact…President Obama visited once. They “protect” the chair he sat in. No one is allowed to sit in it. Regardless of your politics, it’s pretty cool! If you really want a treat, then try the Printmaker’s Inn in the Victorian District. The bed & breakfast features a Button Suite, with a king bed, queen bed and fold out couch – accommodating up to four kiddos. It is a little pricier per night, but includes free breakfast, free wifi, and free parking. It also features a fridge and microwave, a living room, a seating area, a private balcony/patio…not to mention that it is simply ADORABLE! I hope you were able to swim off a little of that lunch, because it’s time for an unforgettable dinner at The Pirate’s House. You could walk…you could Lyft…but the MOST FUN is by Pedicab! We all rode together from the hotel, with the boys in our lap. It was so much fun to whiz by everyone, get great views of the city, and feel the wind in our hair. Our hotel was a few blocks away, and the trip was $10 (plus we gave him a $5 tip!) Easy and exciting for the kiddos. I’ll be honest: I’d heard mixed reviews about The Pirate’s House….about it being touristy, etc. However, our experience was incredible! I recommend making reservations so that you can be seated without a wait (You can do that on their website.) The boys were greeted with kiddo menus in the shape of pirate’s hats, an eye patch and a few “gold” coins, which pre-occupied them for the entire meal. Hubs and I started with Rum drinks, and the boys followed suit with adorable kiddo mock-tails in bright colors and wild flavors. The trout with crab was delicious…with veggies and mashed potatoes. Hubby had the signature pecan-crusted friend chicken. WOW! If you don’t get this, someone at the table must. It’s amazing…and there is more than enough to share. Afterward, we took a tour of the restaurant with a pirate (tip your corsair, please) and then headed upstairs to check out the gift shop. Of course we left with a hook-hand and trick dagger. lol. If your littles are able to stay up late then purchase tickets ahead of time for the Ghost City Grave Tales Ghost Tour. It starts at 9pm…which is why I add the caveat. This is a family-friendly tour with about 90 minutes of walking through Savannah’s haunted mansions and historic homes, haunted cemeteries, burial grounds and battlefields. It’s also one of Savannah’s most highly-rated tours. In all honesty, this is the one we really wanted to see: Savannah Ghost Show. It seems, however, that it is closed for the summer. I do recommend trying to give them a call if you are headed over. Maybe you’ll have better luck than we did. Ok – now off to bed with you! We have a big day tomorrow. Rise and shine early, friends! Many of the hotels we mention have a restaurant, but you can always head out on an adventure of your own. We spent breakfast our first morning at The Coffee Fox. In all honesty, it was because my son has a love-affair with foxes…but it turned out to be a REALLY great coffee shop. I highly recommend the iced horchata – it was the bomb. The boys had chocolate milk and pastries. Dan went for a mini quiche and I had a cheese plate with fruit. Perfect breakfast fuel. Ok. Now you are ready for the trolley tour. This, my friends, is my secret weapon! You can call ahead and get a free shuttle to the starting point from your hotel. They just need a few moments notice. You learn a great deal of history about the city from the tour, which is much better than walking around and trying to read a travel brochure. You can hop on and off the trolley at any time you want…so you can explore any areas of interest and then jump back on for the tour. If your kids are getting antsy then just jump off to explore. BUT, if you take our suggestions, you probably won’t run into that issue. Our kids are the antsy-est of all and they we re just fine! You start at the Welcome Center, across the street from the kiddo museum. Stop 4 – Forsyth Park. Get off here! Forsyth Park is where the famous Forsyth Fountain is located. You NEED a family photo here. After that, if you’re visiting in summer time, head to the playground and spray fountain. Then, we walked to the far side of the park where we found the Saturday Farmer’s Market. We opted for King of Pops to stave off a little hunger, and explored some great veggies and treats. This is a SUPER farmer’s market! Definitely worth visiting. Walk back to the place you got off and get back on the next shuttle. You’ll be wearing a sticker on your shirt, so they know to expect you. Just hop aboard. Stop 9 – Tefair Academy. Get off here! The kids adored the ArtZeum, their interactive children’s museum space, and there is also a Drop-In Studio, open daily from 1-4pm, if you want to do an art project. Now, don’t jump back on the trolley…instead, take a leisurely half-mile walk to Green Fire Pizza. Order inside (great pizzas from organic ingredients, including gluten-free, plus salads) then find a table outside and relax. It’s in a renovated gas station, which makes it fun. You can also get your pizza to go if you want to take it to one of 22 squares in he district and enjoy a picnic. From there, we walked to Leopold’s Ice Cream. It’s another half-mile walk – very easy. If your kids are complaining, jump on a pedicab…but our kids were so excited for ice cream that it was a non-issue. Leopold’s is a Savannah tradition – they’ve been crafting their award-winning, homemade super-premium ice cream since 1919! In peak tourist season, right after lunch…the line will be down the block. Don’t worry, it goes pretty fast. Plus, you just can’t skip this! It’s like going to Paris and not seeing the Eiffel Tower! We tried the chocolate, strawberry, mint chocolate chip and peppermint …. every flavor was divine! Next time, I’m getting the chocolate nut sundae…or maybe a milkshake…and an ice cream sandwich…too many options! Now, eat your sweet treat as you head back to Stop 9…and jump on the bus! So, we hopped off at Stop 15, which was across the street from our hotel. If you are staying near the water, any of these stops will do. You can simply head back to your hotel for dinner…or take the tour all the way back to your starting point and get a shuttle back to your hotel. What ever is best for you! Moon River Brewing Company is known for being one of the most haunted buildings in Savannah! It was visited by several famous ghost hunter groups, too! Not only was it the first hotel in Savannah, but it was also home to the first branch of the United States Post Office in Savannah. It was also a hospital during the yellow fever outbreak..and so much more until 1999 when Moon River took over. Ask your server for a peek upstairs, and see if you get chills like we did! There is an inside restaurant here, as well as a more formal beer garden outdoors. We opted for informal and sunshine, so the beer garden it was! I highly recommend it. Kids can choose hamburgers, hot dogs and grilled cheese. We opted for a hamburger (grass-fed beef) and pulled pork sandwich. I loved the Texas caviar…a tad spicy which is divine! They also brew their own beers (the Captain’s Porter was AWESOME!) and have a full bar. After dinner, walk across the street to the River Street Area. We stopped in Savannah Bee Company and sampled some honey, then found our way to Wet Willie’s for a frozen adult beverage…and pop your head in any restaurant for a lemonade “to go” for the kiddos. Near Wet Willie’s you’ll find a “playground” for the kids. It’s actually just a large boat they can climb in, but it is FILLED with kids. We sat on the bricks enjoying our drinks while the boys played for well over an hour. Ce sure to bring several singles…people along the river walk will sing, play the trumpet, offer magic tricks, make balloon animals…and the kids will be amazed by all. You’ll need a buck or two to cover their gawking. Once they start getting restless, you can catch the Savannah Belle’s Ferry right there by the playground area. This is public transportation offered by the city, so hop aboard for free. Ride from the playground to the hotel over on Hutchinson Island then to the Waving Girl statue and back to the playground….a nice triangle of free exciting water adventure for the kids! Plan to be on the water about 30 minutes for the complete triangle. One last adventure that you can’t miss before leaving River Street is Echo Square. It’s located across from Bob’s Your Uncle. This simple gray square in the concrete holds an amazing mysterious experience. Have your kiddo stand in the square and speak…he can hear his voice echoing, but you can’t! Switch places and “hear” the echo chamber at work! Wake up! This is your last day here!! Time for coffee and a cinnamon roll the size of your head, at Savannah Coffee Roasters. I recommend the French press so you can taste the full flavor of their coffee. I’m going to give you three options before heading out of the Savannah Historic District…coffee and cinnamon roll in hand. You pick what’s best for your family and kid’s temperament. a) Take a stroll along Jones Street. The tree lines and 19th century architecture have won it notoriety as one of the prettiest streets in the US. Chances are you have left your hotel now, so you are driving. No worries. You can park on Jones Street with a cheap meter rate OR around the corner on Abercorn for free. Bring your camera! b) Visit Cathedral of St John the Baptist for Mass. Honestly, we are not “go to church” people, but the architecture is so gorgeous that I was almost compelled. If you want to see inside and take pictures then jump off this stop on Saturday’s trolley tour. c) Didn’t get all the photos you wanted in this gorgeous town? No worries. Pedicab drivers love to take you on a Pedicab Photo Tour. Prices range from “pay what you want” to about $45…They take you around to the best photo spots…let you jump off for pictures, and then jump back on to head to the next spot. No stress! Ok – time to head back home. Before you do, take a short detour to Wormsloe Historic Site. There are often re-enactments and other fun events here, but my desire was simply to drive the 1.5 miles between the grand live oaks you see in the photo above. No photo of these trees can do them justice! Stop, pull over…take a few dozen photos. Then, head to the back of the park where you can tour the museum, and see the tabby ruins of Noble Jones’ home. He was a carpenter who arrived to Georgia in 1733 with James Oglethorpe, making him one of the first settlers from England. Wormsloe’s tabby ruin estate is the oldest standing structure in Savannah. Have fun going home (don’t forget to gas up before getting on I-16) and please share your pictures with us on Facebook! And if you are looking for more ways to vacation on the Georgia Coast with kids, we can help, just read our article on 47 Things to do with Kids on the Georgia Coast. Disclosure: Thank you to our dear friends at Visit Savannah for hosting us on this adventure. Opinions here are all our own (as always!) Also, this post may contain affiliate links to help us with gas money. It’s at no cost to you! 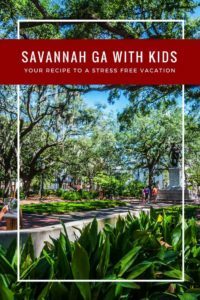 2 Comments on "Savannah Ga With Kids: Your Brilliant Guide To A Stress Free Vacation"
Just seen this great article if you are ready to plan your holidays for next year. Have a look, its good to know.